· Packaging Details:SEAWORTHY PACKING or As per buyer wish. 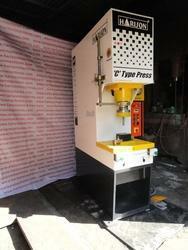 Established in the year 1994, at Rajkot (Gujarat, India), we “Hari Engineering Works” are engaged in manufacturing and supplying an exclusive range of Hydraulic Power Pack & Cylinder, Deep Drawing Press Machine, Four Pillar Type Hydraulic Press Machine, Four Column Type Fix Frame Press Machine, Hand Operated Hydraulic Press Machine, C Type Press Machine, H Frame Hydraulic Press Machine, Component Washing & Drying Machine and many more. Our offered products are noticed for unique features like durability, sturdy construct, dimensional accuracy, fine finish and corrosion resistance. Our company is the MEMBER OF RAJKOT ENGINEERING ASSOCIATION. Further, for excellent fabrication process, we have recruited 10 employees and annual turnover is Rs. 50 Lakh - 1 Crore. Our professionals obtain raw material from authentic vendors to make super-quality products as well as we offer these products in various specifications in order to satisfy various needs of the clients.